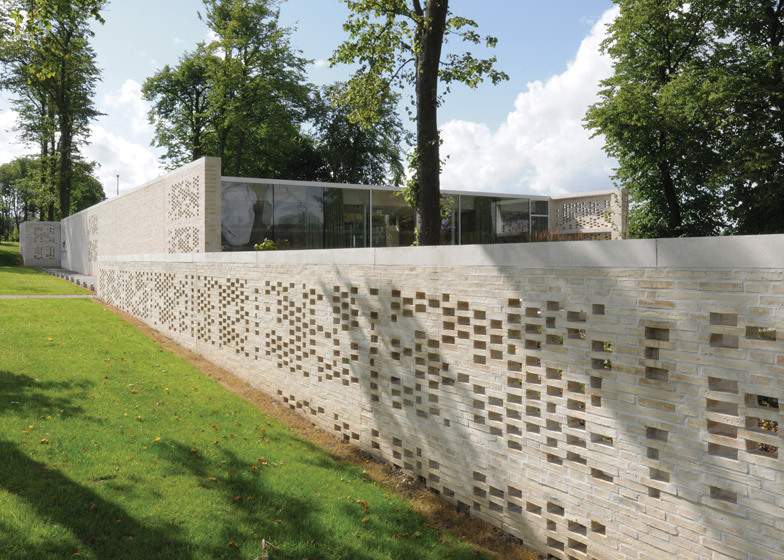 A perforated brick wall encloses a series of internal courtyards and gardens at the latest Maggie's Centre for cancer care, designed by Edinburgh office Reiach and Hall Architects (+ slideshow). 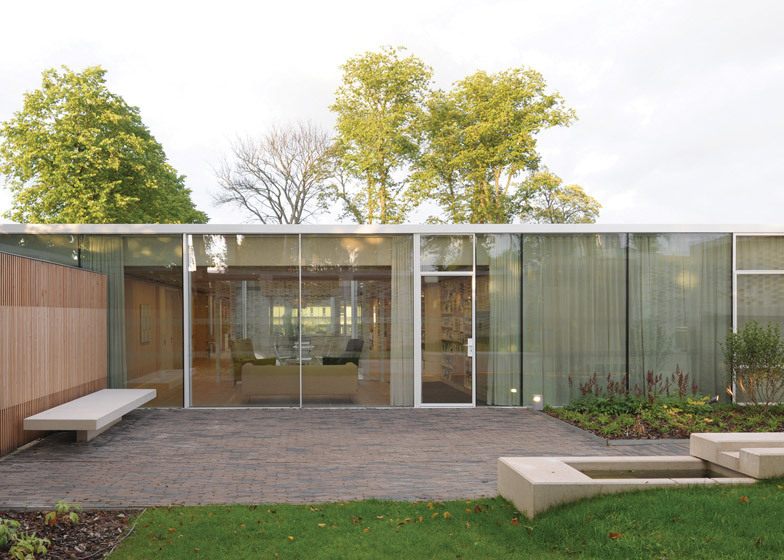 The design for Maggie's Centre Lanarkshire by Reiach and Hall Architects seeks to reinstate a sense of boundary and tranquillity to the edge of a tree-lined estate occupied by Monklands General Hospital, which has gradually been overtaken by car parks. 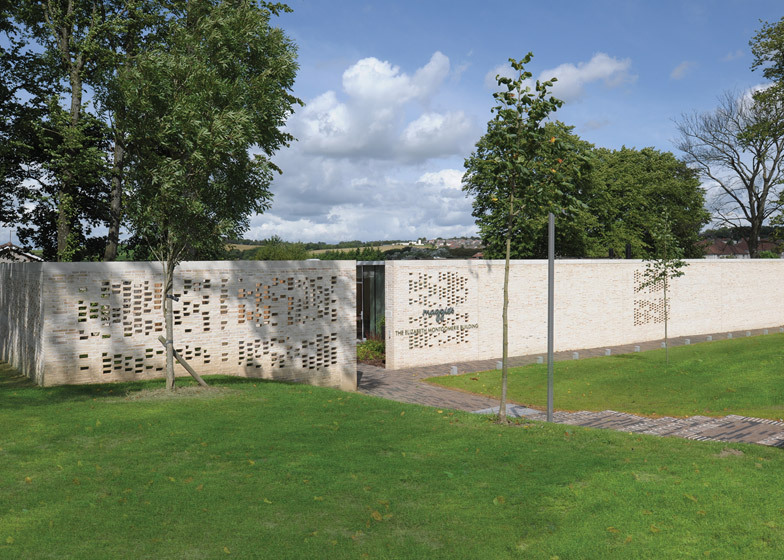 "At its heart, the design of the Maggie's Centre at Monklands General Hospital is simply a tale of enclosed gardens," said Neil Gillespie of Reiach and Hall Architects, which also recently completed a textured brick building for Scotland's Battle of Bannockburn Visitor Centre. 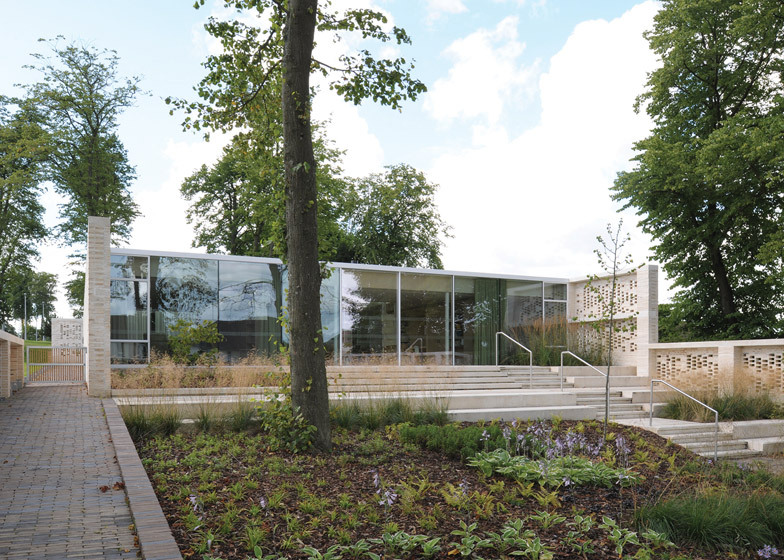 It is the 16th centre to be built for Maggie's, a charity founded 18 years ago by the late Maggie Keswick Jencks and architecture theorist Charles Jencks to provide care and support for people affected by cancer. 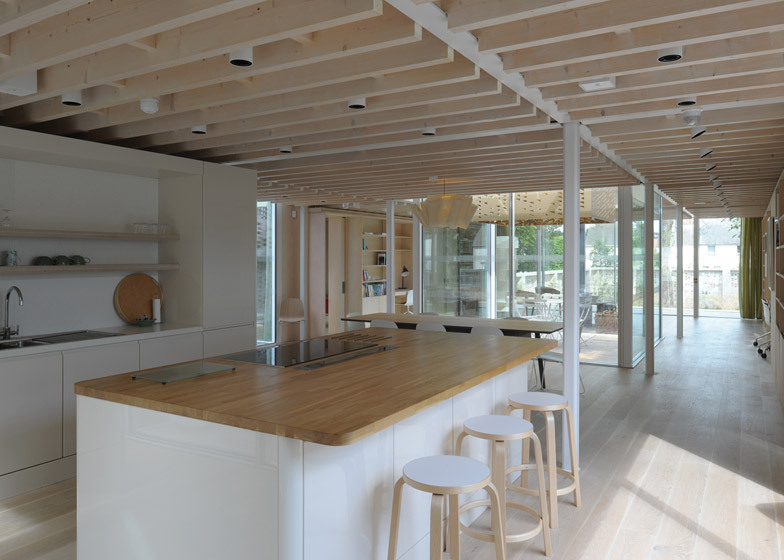 Other architects to have designed centres recently include London studio Carmody Groarke, Norwegian office Snøhetta, and Norman Foster, whose scheme is due to be built by 2016. 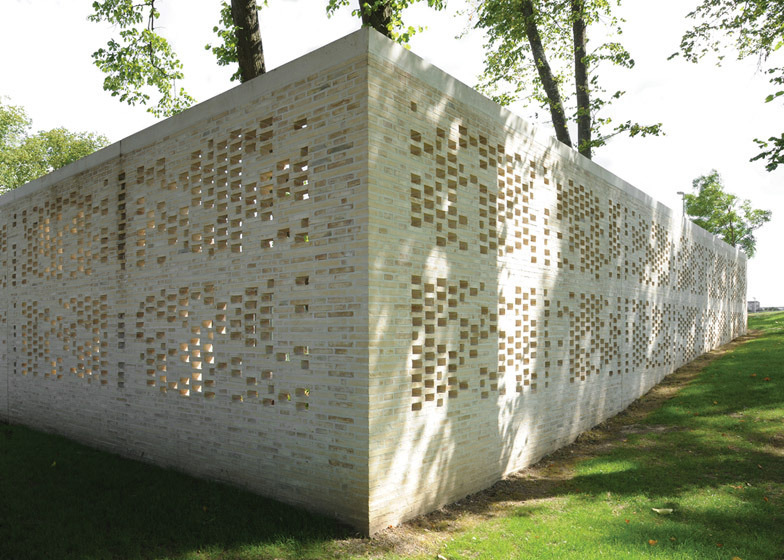 The wall surrounding Reiach and Hall's design was built with handmade Danish bricks to give the building a tactile, crafted quality, and is intended to provide a degree of separation from the hospital grounds, while still offering a connection with adjacent trees and grass through the perforations. 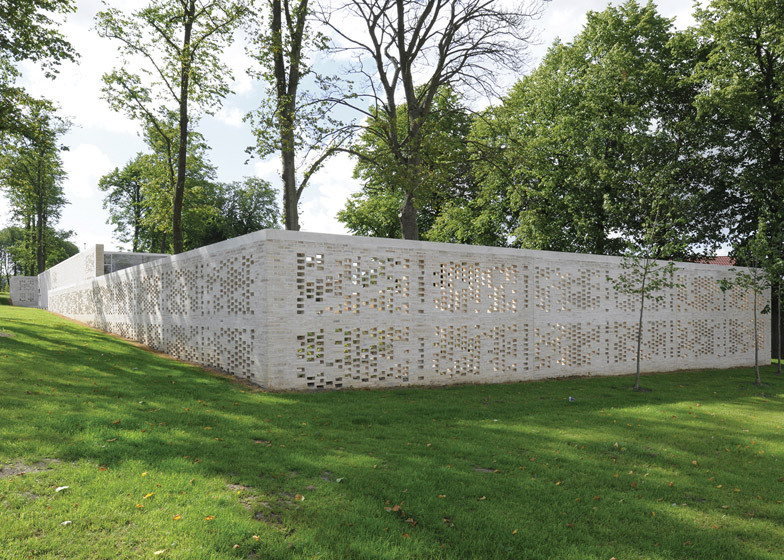 This wall conceals a low, modest pavilion, which features a sequence of internal and external spaces designed to have a domestic, approachable scale. "The idea of something discovered, something only revealed through crossing a threshold appeals to us," said Gillespie. 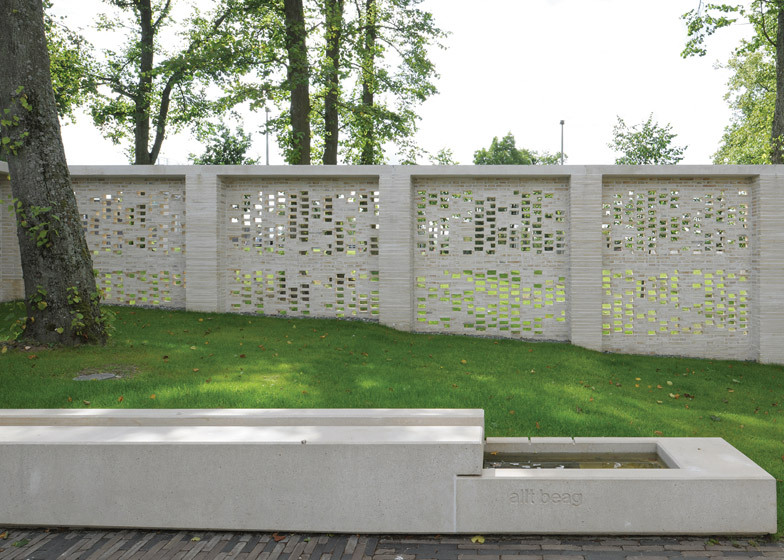 Visitors arrive through a gap in the wall to an entrance garden, which features a shallow channel of water designed by Scottish poet Thomas A Clark and alludes to healing properties. 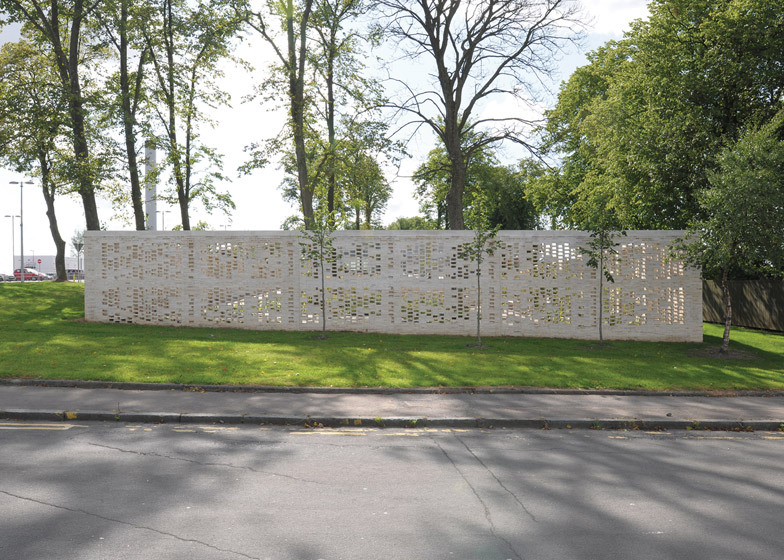 Edinburgh-based artist Alan Johnston and Amsterdam-based artist Steven Aalders also gifted new works to the centre. 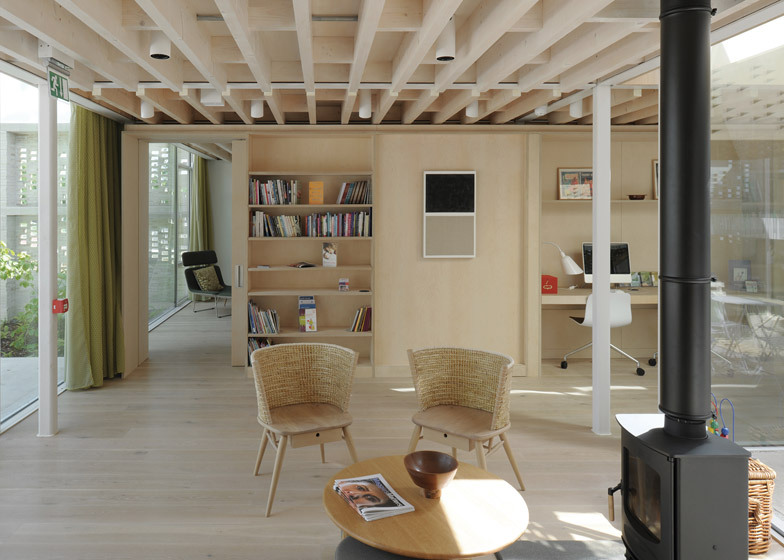 Inside the building, a procession of communal spaces leads through the middle, including a kitchen, dining area and library, while more secluded areas are arranged at the sides, including counselling rooms and a living room. 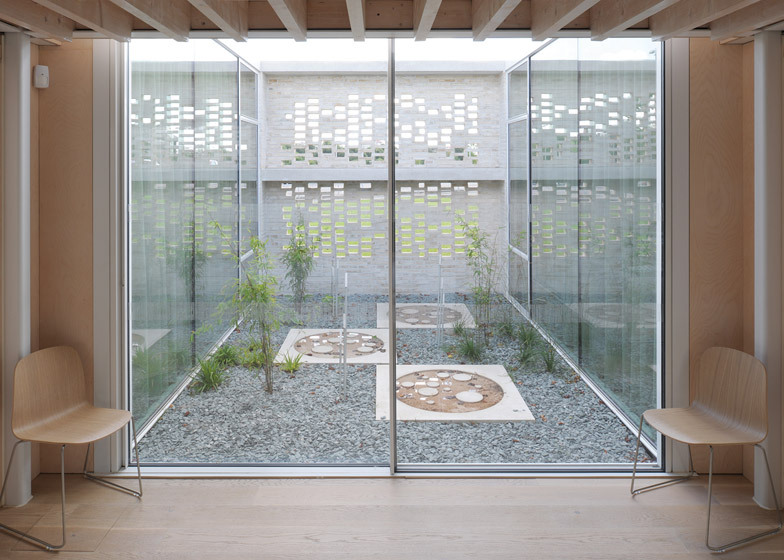 Four small courtyards were added around the building to bring in light and provide sheltered outdoor spaces, including two in the centre that are topped with reflective perforated light catchers. 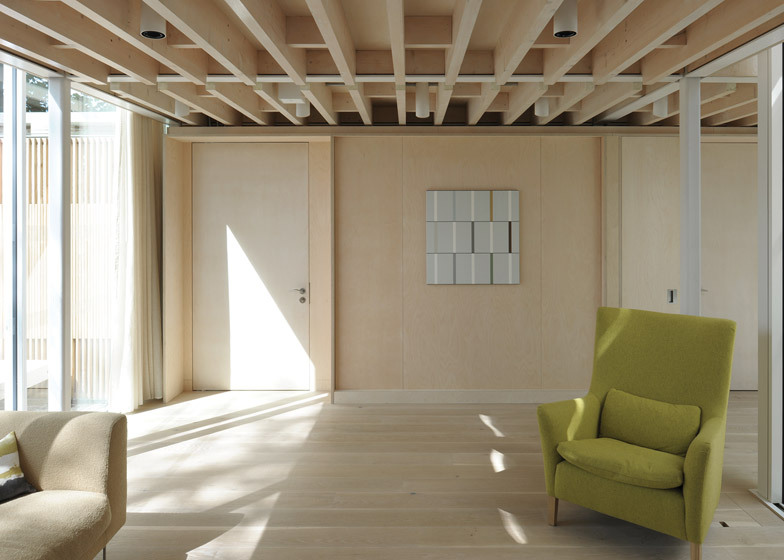 The space culminates with a wall of glazing that opens out to a garden by Rankin Fraser Landscape Architecture, which will provide pockets of secluded and contemplative spaces as it grows and matures. 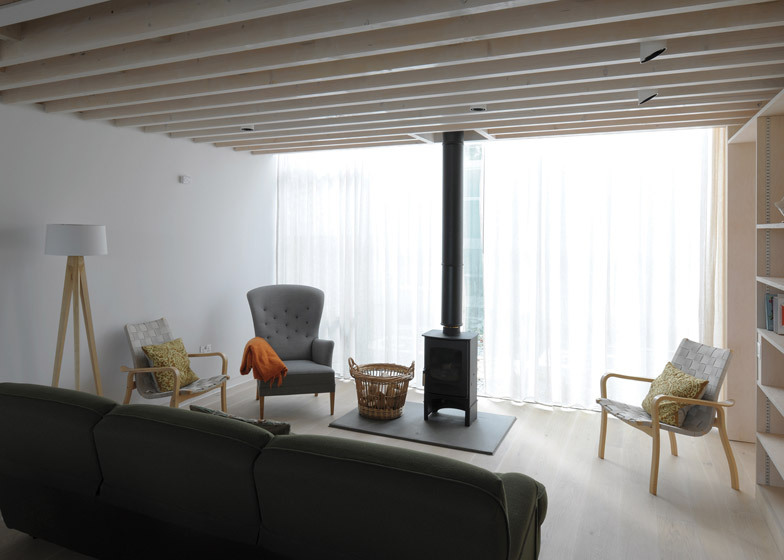 Throughout the building, the architects used a muted palette of materials, including blonde Finnish birch on the walls, limed oak on the floors,and white-stained pine on the ceilings. 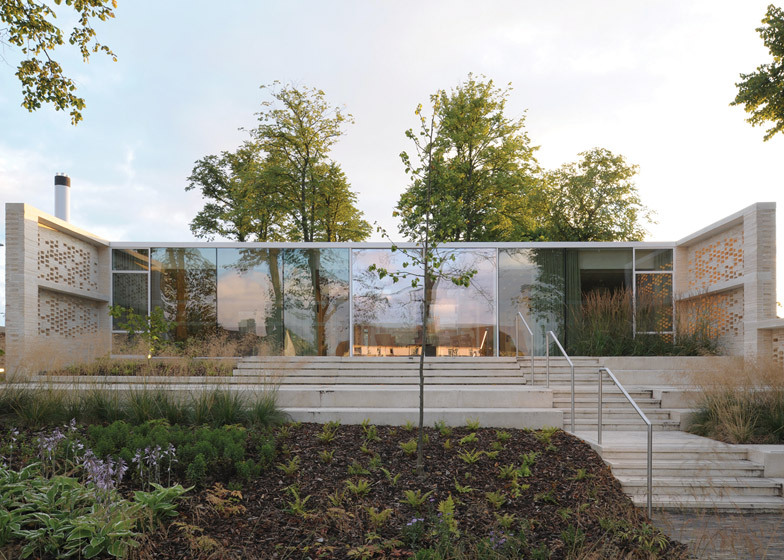 The Lanarkshire centre is the second Maggie's building to be sponsored by the Elizabeth Montgomerie Foundation – a charity set up by golfer Colin Montgomerie in honour of his late mother, which also funded construction of Snøhetta's centre last year. Photography is by David Grandorge.